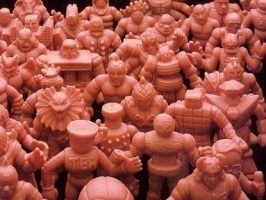 When I go to parties people don’t want to talk about M.U.S.C.L.E. figures. It was an easy lesson to learn. However, Batman v Superman is another issue. This weekend I was able to find out that Batman v Superman is casting 60 speaking roles. Zack Snyder is working directly with a local casting agency. They are targeting Metro Detroit talent and some of the 60 roles have already been filled. So, Metro Detroiters can keep their fingers crossed. The film will continue to need extras, but the 60 roles may be starting to disappear.